Deodorizers are surely a great way to make your rug smell excellent. There are numerous varieties of scents, which you can find in the markets, but most of them involve chemicals. Some products can cause allergies or have a negative impact on someone's health. A common person won't recognize these chemicals. I can advise you to use only natural substances. Switch to the green side and follow the tips here to make a deodorizer with strong or light scent. Before we start with the recipes, you should know a few things when it comes to safety. Make sure to keep pets and children away from the mixture, which we are going to review below. This is the first natural deodorizer, which you can try. The exact measures of the ingredients are 1/2 cup of borax and 1/2 cup of baking soda. The main advantage against every single commercial deodorizer is the ability to absorb odor, not to mask it with heavy scents of chemical substances. To make the mixture the just place the products in a shaker with large holes. When it's ready just sprinkle it on the rug. This mixture should sit on the rug to freshen it and absorb the odor for 15 to 30 minutes. Afterwards you can just vacuum the deodorizer and shake off the rug, if you have permanently attached carpet, then simply vacuum. Again we have baking soda here as a main ingredient. However, you will also need glass or ceramic bowl for the mixture. 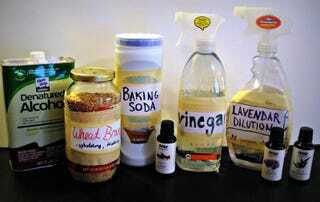 In addition to the baking soda, you should add essential oil. Seven to ten drops are enough, but make sure to mix it well. You can either sprinkle or pour the solution on the carpet. Let the mixture sit there for 20 minutes and then vacuum thoroughly. Anyway, be very careful with the fragrances, because they may cause problems for allergy sufferers. Another fine mix of 1/2 cup of baking soda and so of cornstarch to use as deodorizer. Again sprinkle thoroughly and wait for some time before removing the mixture. Use your vacuum cleaner to clean up. A great benefit of using cornstarch is that it has the ability to remove minor stains. It soaks them up very efficiently. This is actually an addition the the borax or cornstarch recipes. A simple teaspoon of crushed cloves or ground cinnamon will mix very well with both recipes. But you can also use herbs separately - leaves of crumbled bay or dried lavender flowers can be placed in the room to achieve an amazing natural scent. Follow the exact measurements at first, but you can also modify later when you gain experience. According to most specialists in carpet cleaning, you can try different variations without any harmful effects. Just don't be scared to try new things and get to the best result. Where to Get a Real Christmas Tree Around London? How to Get Your Kids Gardening - And Loving it!